Foxconn is not just the largest gadget manufacturer in the world, the Chinese company is also a gated empire living by its own rules with no journalists allowed to look at what’s happening inside. French reporters however managed to spy their way into the iPhone-making fortress that is Foxconn and saw few improvements for worker conditions in the dorms. Apple promised to fix those issues earlier this year, but fast forward to almost the end of 2012, and little seems to be done. A 60-minute special airing on France 2 TV station, Envoyé Spécial, showed an undercover look at Foxconn Zhengzhou. Dorms that look like raw projects with no electricity, elevators or running water are where employees live. The undercover reporters did not meet any underage workers, but there were some of legal age who were forced by school administration to work at Foxconn. Monthly salaries grew earlier but employees are not paid the full sum but charges for house, insurance and food bring wages down. Envoyé Spécial arrives at the logical conclusion that rushing to get production in line for the iPhone 5 is what’s causing all those problems. With a huge turnover, Foxconn has to recruit people from provinces, often on huge hiring campaigns. “Foxconn takes our responsibility to our employees very seriously and we work hard to give our 1.4 million employees in China a safe and satisfactory working environment. We are mandated by our own strict policies, Chinese government law, and our commitments to our customers to ensure that the highest level of health and safety standards are applied to our operations in all locations throughout China. As China's largest private-sector employer, we provide compensation and benefits that are much higher than the government-mandated wages and that are competitive with all of our industry peers in every location where we operate. We are committed to the process of continuous improvement to our workplace policies and practices and we uphold that through regular reviews of our operations by our internal teams, customers, and government regulators and if any areas for improvement are noted, they are immediately addressed. One example of our commitment to this process is the Action Plan that we are currently implementing in areas throughout our China operations following the review earlier this year of some of our operations by the US-based NGO, the Fair Labor Association (FLA). A follow-up review by the FLA showed that we are successfully implementing that Action Plan and we are ahead of the schedule for completion of elements of that program. i can clearly see what indians had done with nokia...you don't have to tell them..because INDIA is the LARGEST consumer market for NOKIA..!! Indians TRUST NOKIA..!! Exactly. That's who we need to look at...china. They allow it to happen. the article titled "To meet iPhone 5 demand......" and earliar there was an article "Analyst: iPhone 5 Game Over"....!! PA please tell me who that analyst was..?? PA, you make a flop after flop, you just can't get enough, hm? "Foxconn is not just the largest gadget manufacturer in the world, the Chinese company..." Foxconn is (luckily)a Taiwanese company, not Chinese. It may be the largest Chinese employer, but still Taiwan is not China. Let's hope it will never be. and this is why apple will not bring most jobs back to the US.. when this i allowed in other countries. 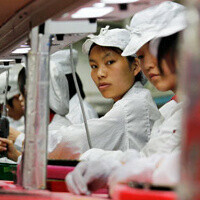 so you are saying China has the decision on where Apple products are made in? lmfao... Considering Samsung sells more phones than Apple, the sensational headline is hilarious. WOW. Let's make people live and work in sub human concentration camp conditions all so a bunch of spoiled rotten entitled teenagers can have a sub par novelty phone by christmas. What a disgusting vile company.